It is almost that time of year where we rack our brains to spend thousands of dollars on things that we think our loved ones will enjoy. After a time that chore becomes almost unbearable. So, with that in mind I am going to help you out a bit. Books are a wonderful source of entertainment and education. No, really even fiction books can and are educational. A writer worth their salt will through in things that are real, for instance Tim Dorsey who writes about my favorite serial killer Serge Storm writes about all things Florida in his over the top comedy books. He travels all over Florida to out of the way places for information for his character Serge and his sidekick Coleman. It is filled with the history of Whitechapel and the crimes of Jack the Ripper even though he may or may not be the principle character. Now if you are looking for something a bit more sinister check out Brilliant Insanity the places in the book are Savannah and Fort Pierce, Fl. Now if you are a true crime buff and are prepared to read facts not fluff check out Silent Scream This book is about the victims of Florida’s first serial killer Gerard Schaefer. It is not for the faint of heart – it is raw and brutal just like the murders. So if you don’t have a stomach for facts instead of fluff I do not recommend this book. My second true crimes is The Last Rites this was also a very brutal murder in Fort Pierce, Florida the victims Pauline Metler was raped and executed. Again if you want fluff do not buy this book – it is also raw and brutal. If you are looking for inspiration well you have come to the right place, Pennies From Heaven no this is not a how to book on dealing with grief. It is however, the stories of others who have dealt with death and grief. It is a book that was written to show how others dealt with death and that grief is personal, there is no set time to grieve, nor is there any set way to grieve. It is a book to help bring comfort and peace. Then I have Dream Catcher Failure Was Never an Option The true story of a man who is handicapped who has succeeded because of his handicap not in spite of them. He has used his handicap to be unique as we all should. In this world we are all handicapped in some way. It is up to us to succeed by trying instead of saying I can’t and failing. Now if you like anthologies filled with horror I have those as well. 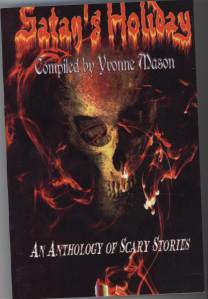 Welcome to Your Nightmare Satan’s Holiday A Merry Scary Christmas all of these anthologies are filled to the brim with short stories, flash fiction and and poems by several different authors. Then I have historical fiction. I know. Isn’t this great? One stop shopping for all those on your list. Check it out A Voice From the Grave All of my books are downloadable on both kindle and Nook and they are all in print form. Some of them are audible as well. There is no reason not to by my books. I have made it so easy for you. There is something for everyone. And just to add to the mix you can find me on facebook at Yvonne Mason or just google me. I am all over the net. May the holidays find you happy, healthy and safe. Love yourself, and each other. Hold the memories tight because one day that will be all you have. Before One Takes Jabs One Should Stop and Think! There is an author friend of mine who has written several books,this is a dream she has had for a long time. However, as things go life got in the way and she ended up with some health issues. One of those health issues was brain damage. However, this has not deterred her from her dream. Now, with that being said, one of her books received a very nasty review and then a nasty comment. After reading the review and the comment, I decided it was time to stand in front her her bullets and taken them for her. First of all we never know what battles someone is fighting. So we should always season our speech with a little salt. Next. The review was not a review. It was a critique and not a very good one at that. Second the snarky comment that was made was totally uncalled for and hurtful. Reviews are not supposed to be personal – it was a double whammy as the review was personal and the comment was personal. A good reviewer would have discussed the storyline, not the author. I have ordered this book, I will indeed read it. For those of you who have never put pen to paper – you have no idea how hard it is – as for the publisher who published this book. Well, Author House is a vanity press, They do not edit. Sadly, most indie authors, especially those who have never published before do no understand the snake pit that vanity presses are. They take your money and give nothing in return. They do not edit, nor do they market, they just put the book to print and make you sign a contract for seven years and then if you want the copywrite back you have to pay them a huge amount of money. So, Ms. Merenda, if you would like to help this author, how about offering your editing services for free. How about encouraging her instead of discouraging her. My question to you is – Do you have dreams? Has anyone tried to steal them from you? That is exactly what you are doing to this author. You are trying to destroy her dream simply because you simply don’t know how to write a non personal review. Nor do you offer your help to a woman who is trying to live her dream with a challenge. Dest, this is for you. Shame one you. Taking cheap shots is not classy at all. If you didn’t read the book and just read the excerpt, well, you have no idea if you will like it or not. And to make such sarcastic remarks at this author’s expense says quite about about your character. Not in a good way. A very wise woman once told me that when we open our minds to what we read, it is amazing at what we might learn. Never read a book with a closed mind, it does two things, it keeps one ignorant and it makes them look stupid when they try to write reviews. These two people did not write reviews, they wrote garbage. I for one, who has a brother who has brain damage applaud this author for her courage, her character and her grit. She may never sell thousands of dollars worth of books, she may never find herself on the best seller list, but let me tell you this, she is successful because she did it. That cannot be said for the two people who wrote this dribble – which this author should not even concern herself with. It shows their small minds and their even small character. My challenge to all who read this post is to order her book, read it with an open mind, learn something new and encourage her to dream and live that dream. That takes character. I had interest in the book… until I read the excerpt given. At first glance, this books storyline had a lot of promise. However, just reading the excerpt, it’s very, VERY novice. I don’t think Ive ever read a book that made sure that every word is written out completely. Such as this comment made by one of the police officers: “Sir, we are done here, so we will meet back at police headquarters. We will discuss how and when the murders occurred. We have killers on our hands; we must find them or they will strike again”. Seriously? The sentence could have read ” Sir, we’re done, we’re gonna head back to the office, and go over the facts and evidence we have, and see where to go from there”. It’s like a sixth grader wrote this. I have never seen so many run on sentences, over extended uses of words, drawn out conclusions with having a shred of conclusive information, and yet, also trying to pound in the story so fast as to kill 6 people, vaguely, in 5 pages. The whole story is basically done right there. except, the oh so smart police officers talking back at “police headquarters” about the when, why, what time, and knowledge of more then one killer BEFORE ever making it out of the victim’s house. I don’t even know what story is left anyway? All the promise in the description went out the window with the killing of all the subjects mentioned, in those 5 first pages. And, I’m not even a person who really cares about some errors in grammar or bad editing of a book .But, this one was just soooo bad. This could’ve been a great story. But, it has all the irritating marks of a person trying too hard to tell the story that it loses the punch before it can be poured in the glass. My 15 year old son can write better then this. I don’t pretend to be perfect with my writing or grammar. But, I’m also not an “author” and I’m not expected to be “perfect” in that area of getting a story across. The publishers missed the mark on this one. I can’t even fathom how there are several mis-spellings in the book description alone. It amazes me how lazy this whole thing appears to have been written. I say skip it. Save the $10.00 plus dollars for a solidly written and grammatically proficient book. The Link below will allow you to listen to one of my short stories that will soon appear in a new book of short stories I am releasing. Some of them like Bones have been previously released and some that are brand new. Just a small teaser. The Mad Hatter IS OUT!!!!!!! For those of you who have been waiting for soooo long for this little tale of suspense, horror and all around mayhem it is now available on Lulu. In about six weeks it will be up on Amazon in print and in a couple of days it will be available for download on Kindle and Nook. I know I have taken my time and teased all of you unmerciful about this little ditty. But you know how that goes, greatness takes time to cook. For those if you who are true crime history buffs it does have an interesting storyline which includes the victims of the Ripper. I know you all are saying “Say it ain’t so!” But indeed it is. No, it is not the same old tired storyline. If you are a reader of my books, you know I would never go there. That is just not my nature. You see, for those of you who have never read my work, the voices in my head have their own minds. When I write I have to allow them to tell the story or else they drive me completely insane. Think Edgar Allen Poe. No I am not going to cut off my ear, that was Van Gough, he was an artist. Anyway back to The Mad Hatter. This little book was a year or better in the making. Why? You might ask. Well, it is like this, research takes a minute and when I write even fiction, it has to be believable. As someone once said, I don’t want you to just read the story, I want you to be in the story. Besides that, one has to know how hides are tanned, even those of a different nature. So with that in mind, pull up a chair, wrap yourself in your most comfortable clothes, put your feet up with a liquid refreshment and take a journey with me and the Hatter. I promise you will never look at hats the same way again. Heck you might not even look at humans the same way again. 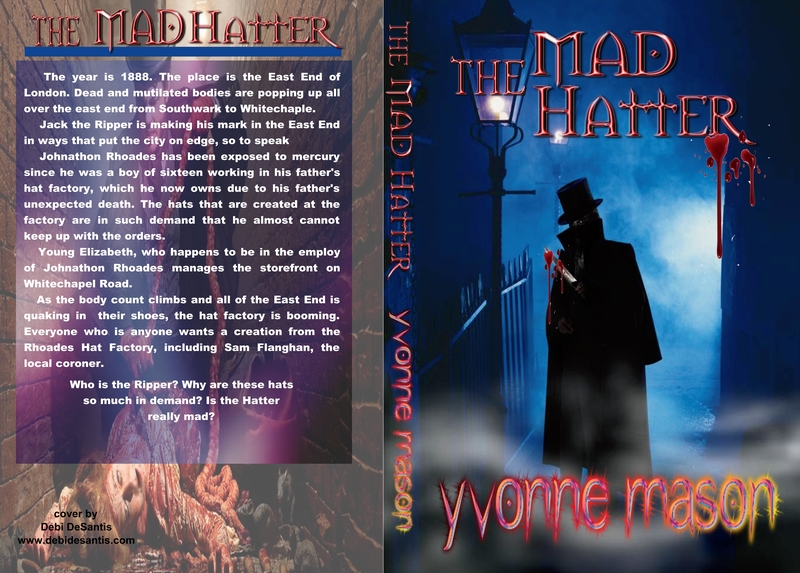 Go back in time with me to the year 1888 the place is Whitechapel. Oh and one more thing, if someone asks you if you like hats, walk away, far away quickly.